Mix the flour together with salt, milk and ghee. Crumble well. Then add water as required to make a soft dough. Keep aside for 10 mins. Divide into 8 equal sized balls. Meanwhile grate paneer. Chop onions as juliennes, this way it does not fall out. Finely chop green chillies and coriander leaves. Mix grated paneer with chilli powder, salt, Onion and Coriander leaves. Make 8 sized balls. I added finely chopped green chillies in the ones which was meant for my hubby dear. He likes his parathas real hot! Flatten the dough by making the sides thin with the center portion thick. Place the stuffing in middle and cover it well. Dust with atta and roll out evenly. 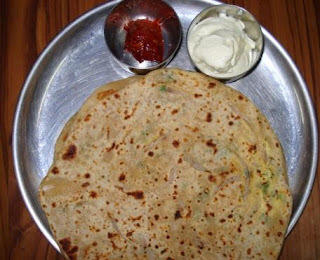 Heat a tawa and fry the parathas on both sides with Oil. Serve this with curds and achaar. 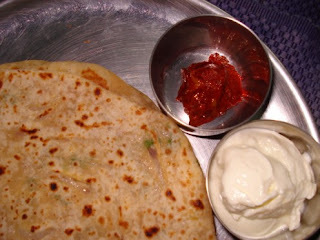 I normally dab a small slice of butter on hot parathas and serve with Avaakai. Sending this to Rich at As Dear as Salt for RCI: Punjab.